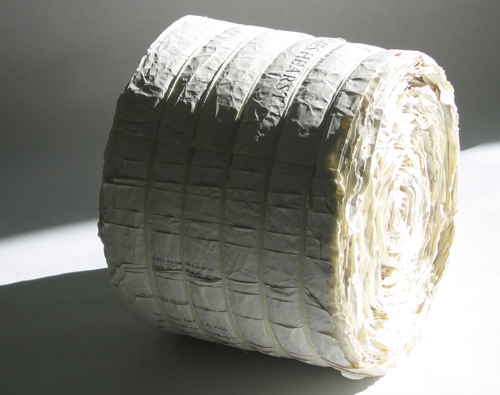 The pages of the book "The Complete Poetry of James Hearst" have been ripped out, then crumpled, flattened, arranged into stacks, rolled, and bound with cotton cord into the cylindrical shape of a hay bale. I believe this shape to be of significance to James Hearst's work, since many of his poems speak of the land and farm life. The hay bale includes all of "The Complete Poetry of James Hearst" and I chose the poem "Landscape - Iowa" as the top layer of the bale.